This page gives our latest information on clubs, societies and organisations operating in and around Purley on Thames, providing sports, social, educational, care or specialised activities in the community. Whilst we try to keep this up to date, we cannot guarantee the accuracy of the information contained here. Please click on the club’s name or website to see this information. We ask that listed organisations contact us if their information changes from that shown. Also, any new organisations wishing to be listed here should complete the Website Form. If you would like to provide additional information on your Club/Society please see the notes at the bottom of this page. Where we have more information or a website address for the organisation listed we have provided a link from their name. If the name is blue and underlined then it will provide a link to the additional information or to the organisation’s own website if you click on it. Providing Scouting and based in both Purley and Pangbourne, we are a uniformed youth organisation for boys and girls (6-18 years old), offering fun, friendship and adventure through a variety of activities from arts and crafts – to games, exploring the outdoors and adventurous activities – in order to give young people the skills and confidence to take a constructive place in our local, national and international communities. Project Purley was founded in 1984 ‘to research and record Purley’s past and present’ We have talks in the Barn from September to April and outings and social events in the Summer.All are most welcome to attend our talks which are held on the third Friday of each month starting at 7.30 for 8 pm. We have published several books and booklets and have a acquired a huge archive of historic documents and and photographs.. We publish a Journal every four months and have staged numerous exhibitions over the years. A friendly, lively group of painters meet Thursday evenings in Purley on Thames. An untutored group where members are happy to share their skills & knowledge, we have occasional workshop/demos. exhibitions and social events. Now accepting new members. Adults, all levels of experience welcome. Please see website for contact details. The PBRA was formed in the 1980s to oversee the maintenance of the woodland held in trust for the benefit of the residents of Purley Beeches. Three or four trustees are appointed together with a committee. An annual voluntary fee is paid by each household towards the cost of maintenance. An AGM and social evening is held annually in November. A flint wall abuts the woodland the maintenance of which also fall to the committee. There is at least one clear-up evening each year when residents are invited to join together to maintain the overall appearance of the estate. The club plays high level football in the Reading Sunday League and our home ground is the Goosecroft. We welcome new players and spectators. Promoting interest in gardening activities through spring and summer shows, visits to gardens of interest, monthly evening talks (open to all). Trading Store with supply of gardening requisites at competitive prices – open Sat/Sun 10-11am, Feb-Oct.
New members welcome – £3.00 per year. Join at Trading Store during opening times. Purley Jubilee FC is a FA Chartered Standard football club running junior football teams from U7 up to U18 age groups. We also run a development centre for 4-6 year olds who are just starting out with their connection with football. The club was founded in 1977 and took their name from the queens Silver Jubilee celebrations of the same year. We currently have over 200 boys and girls registered with the club, playing in one of the clubs 22 teams. On a Saturday or Sunday morning you will see Jubilee’s teams playing at Goosecroft in their traditional red and blue stripe kit. Last year a girls team was formed and play in the Berkshire girls league under the name of the Purley Jubilee Diamonds. The Purley on Thames village hall. It provides affordable space for residents of the village and local area to use for club meetings, social events, group events, weddings, etc. Contact our Booking Secretary on 07772 129187 or visit our website for more details (click on our title above). Celebrating 20 years in May 2019 Purley Pathfinders walk to explore areas both local and within easy reach of Purley on Thames. Walks are held on various weekday mornings and vary in length from 4 miles to 6 miles. A lift share operates from Purley to the start of walks. Four times a year we go by coach to another area eg The Cotswolds, New Forest etc to walk there and visit attractions the area has to offer. We are renowned for being a very friendly group. Do visit our website (click on name above) or ring 07768 986 799 to find out more. Anyone who would like some daytime company is welcome to join us on their own or with a friend. We have regular quizzes and puzzles to challenge your brain, or just come along for tea/coffee and biscuits, and a chat. The 16 bus stops a Chestnut Grove opposite the Club and there is parking in the Club forecourt. There is a nominal charge of £1 per session. See out website (click on our name above) for dates and times of our sessions. Graded ‘Good’ by Ofsted in early 2015, Purley Pre-school is a small and vibrant community pre-school, run by a dedicated team of staff, who are supported by a voluntary committee made up of willing parents – so you too could have a chance to become involved in your child’s pre-school education! We are open from 9.15am to 12.15pm, Monday to Friday (term-time only), and also offer ‘Step up to School’ sessions during the summer term. Why not give us a call on 07525 234747 or email purleypreschoolcommittee@gmail.com to arrange a visit and come in and have a chat. We are a family friendly members club located next to the Recreation ground, just off Beech Road. The club has close ties with both Purley Jubilee Football and Purley Cricket Club and has competitive darts crib and pool teams. We offer a well stocked bar, hot drinks and at weekends some light meal in a lovely location. We are open every evening except Mondays and from 12:00 at weekends. We have a regular entertainment programme including members bingo and many varied sports events shown on screen. For more information call in or see our website (click on our name above). 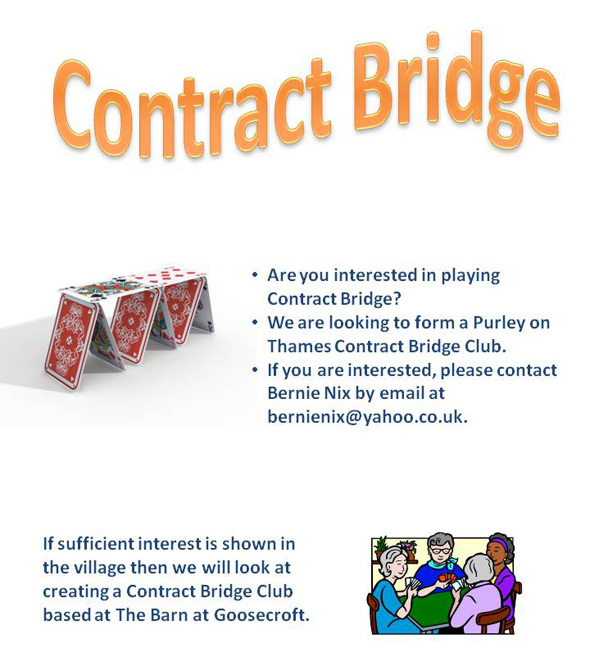 Our Bridge club has now been running for 3 years and we have members with a wide range of skill levels. Games are played in a relaxed and informal atmosphere. We are not able to give formal tuition to absolute beginners, but the more skilled players are happy to review hands and give advice (when asked) to those of us who are less experienced. Some of our members are interested in expanding the games to include Canasta. If you are interested contact Bernard on 0778 718 7363 or bernienix@yahoo.co.uk, or just turn up on a Friday morning at 10am at the Barn, Goosecroft Lane. Purley on Thames CC play at the Goosecroft ground off Beech Road, Purley on Thames. Compete in the Thames Valley League (Saturday 1st and 2nd team) and Berkshire League (3rd team). On Sundays there is a full fixture list of friendly matches. There is also a midweek XI. The club has a thriving and successful junior section, providing quality cricket programmes for 6 to 17 year olds. The Club is ECB/Sport England and Clubmark accredited. We are a small, friendly club with three courts looking out over the Thames Valley in an Area of Outstanding Natural Beauty. To find us, just put RG8 8DR into your satnav; we’re up Goosecroft Lane, off Beech Road. We have club sessions on Saturday mornings from 10.30am and on Monday and Thursday evenings in summer, and all club members are welcome to participate, normally playing doubles. Our club coach also organizes various training and coaching sessions for individuals and groups, for both skills and fitness improvement, all ability levels catered for. We have men’s, ladies’ and mixed teams in the Berkshire league and run social activities throughout the year. Please see our website via the title link for more details. We are an amdram group who started from a one-off production in 1993. Since then we have progressed to putting on three productions a year: a pantomime in January, a comedy in spring, and a murder mystery evening with a meal in early autumn. Shows and rehearsals take place at the Barn and we try not to take ourselves too seriously while giving our audiences as professional a performance as we are able. Our shows help to raise money for local charities. To find out more please contact Chris on 0118 954 8052 or Jean on 0118 942 4372 email us at mail@purleyplayers.org.uk. Look on our website to find out our next show or to see records of past productions. A very friendly parent & toddler group held in St. Mary’s Church Hall, Purley on Thames every Tuesday & Wednesday during term time between 9.45 & 11.15am. Running since 1993, this is a great place to come and make friends while your toddler enjoys playing. Soft area for infants also available. First session free. Contact us on purleytots@hotmail.com or find us on facebook “Purley Tots”. Offers computing and photography courses to over 50s starting from complete beginners to those who want to know a little more. We also offer Tai Chi courses to both beginners and improvers. Trentham Bowls Club is situated at Bowling Green Lane, off Sherwood Rise, Purley on Thames. Provision is made for persons from the age of 10 to play lawn bowls. The club offers excellent facilities for both new and advanced bowlers during the season from mid April until late September. If you are a Purley resident, the upper green is free to use on Wednesday evenings and alternate Saturday and Sunday mornings. No charge is made but flat soled shoes must be worn. Please visit the Club for more information, or call us on 0118 984 5832 (please leave a message if there’s no answer), e-mail mail@trentham-bowls.co.uk or visit our web site on www.trentham-bowls.co.uk. West Berks Scrabble Club is the home of Scrabble in West Berkshire, meeting in The Barn in Purley. We meet every Tuesday evening (7.15-10.00pm) and on the afternoon of the second and fourth Thursday of the month (2.00-5.00pm). Amongst our membership, we have people of all abilities and we warmly welcome beginners to the club, giving assistance in the nuances of the game should they require it. Full details of the club can be found on our website (www.westberksscrabbleclub.org.uk) Alternatively, you can email us on info@westberksscrabbleclub.org.uk or by phone on 0118 984 5045. Berkshire Family History Society can help all family historians living in and around Berkshire – wherever your ancestors came from. Visitors are welcome at all of the six Branch meetings held each month — in Abingdon, Bracknell, Newbury, Reading, Windsor and Woodley. Practical help and advice is available at the society’s Research Centre in Reading. (next to Berkshire Record Office). It is Berkshire’s foremost facility for family history research and online datasets of Findmypast, Origins, The British Newspaper Archive and Ancestry Library Edition are available for use. Goring Gap Boat Club is one of the largest recreational boating clubs in the Thames Valley. Membership is open to all, from youngsters gaining their first rowing experience to veterans with a lifetime’s experience on the river. Beginners are assured of a warm welcome and a relaxed, safe introduction to the sport. No previous experience is required and we provide tuition to all new members. The club’s aims are simple – “… to make it possible for members to enjoy unpowered boating …”. Club sessions take place on Saturday, Sunday and Wednesday mornings and, in the summer, on Tuesday and Thursday evenings. The Volunteer Centre was established in 1976 to provide transport to hospitals, surgeries, day centres etc for the people of Pangbourne and surrounding parishes including Purley and Denefield. Our office is open Monday to Friday in Pangbourne Village Hall from 09:30 to 11:30 (telephone 0118-984-4586) We are always on the look out for volunteer drivers, especially from Purley as we have far more clients than drivers. We are not a free taxi service but are always willing to help if we can with almost any problem. Clients are invited to make a small donation towards running costs and we are grateful for the continuing financial support of Purley on Thames Parish Council over the years. We are a friendly, fun loving group aiming to sing a wide range of music, both popular and classic, to a high standard. We have three concert productions a year, spring, summer, and Christmas which are held at a variety of venues in the local area. We welcome new members when positions in the choir become vacant. To find out more about us or if there are any vacancies please contact Ken Baker on 0118 943 2778 or email us on mail@thamesvalesingers.org.uk. Look at our website to find our next concerts or more about us. We are a group of ladies who enjoy lace making and all forms of needlework. New members are welcome. Contact Diana Mattison on 0118 942 7574. If you do not have your own website and would would like to provide more information on your Local Club please complete the Website Form. It should either be a Microsoft Word, PowerPoint or Publisher document with up to two A4 pages. It can contain pictures, text, diagrams or any thing else that can be placed in these documents. Your submission will be converted into a Adobe pdf document, which all should be able to read, for publishing on the website. Purley on Thames Parish Council reserves the right to refuse to publish any information which it deems to be unsuitable. This service is available only for local clubs which operate on a not-for-profit basis.